In the mid 2000s Thirsty Merc took Australia by storm, inundating the airwaves with their hit singles ‘In The Summertime’, ‘20 Good Reasons’ and ‘Someday, Someday’. Now, 16 years after their formation, the Sydney boys are still going strong. Following a brief hiatus and an overseas venture, the band are back and taking their live show across the country. Ahead of their gig at O’Donoghues in Emu Plains later this month, front-man Rai Thistlethwayte told the Weekender that getting up on stage with his band mates gives him a tremendous amount of gratitude. “I know there are a lot of people out there who can’t wait to get away from their jobs but I’m feeling very fortunate that I can say after 16 years that I still get to work with my best mates on stage every night. It’s just awesome,” he said. While performing with his band mates Phil Stack (bass) and Matt Smith (guitar) on a nightly basis holds a special kind of significance for Thistlethwayte, he says connecting with their audience and getting them away from “their week of work” is what makes it all worthwhile. “I was in the band room with the guys in Ballarat, a beautiful old town, and we were at a pub where the upper levels of the building were still completely original, it was this really old looking building,” he recalled. “We were standing on the balcony there and I just remember saying to the guys before going on stage ‘this is incredible, we’re here, it’s a windy cold night, but we’re all here and we’ve just got to get on the stage and make everyone in that room happy. 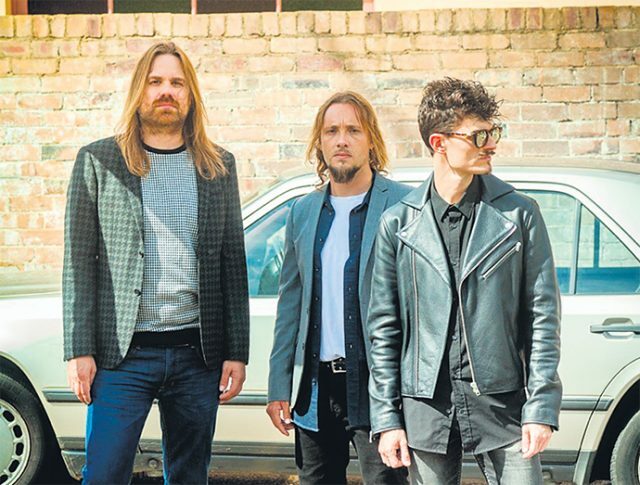 Anyone hoping to attend one of Thirsty Merc’s shows is in for a treat as Thistlethwayte says that after years of experimentation the pop rockers are now experts at crafting an impressive, crowd satisfying set list. “We know ways of engineering the set list to have a good flow; we start strong, get a nice journey going on and leave everyone with a smile on their face,” he said. The band will of course perform all of their hits at the Emu Plains show but there’ll likely be a few surprises thrown in as well. Thirsty Merc will be playing at O’Donoughues in Emu Plains on Friday, November 30 from 7pm. Tickets are $22.55. To book or for more information, call 4735 5509 or visit www.moshtix.com.au/thirstymerc.